Whenever I feel low or dull, shopping is the only thing that makes me feel good (read awesome!). What can be better than online shopping? You got to shop while sitting on your bed with a milkshake in your hand (ok I don’t drink coffee!) and select from among so many brands in one place. I always search for coupons while I do shopping to save some of my money. How do you feel when you earn while you spend? I actually felt very happy when I got to know about Cashkaro.com. It is like a God gift website :). 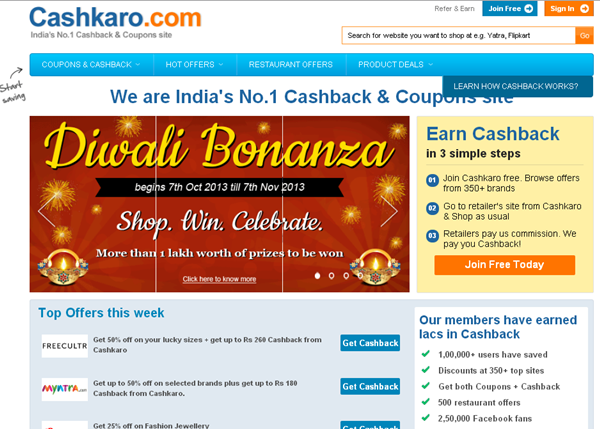 Cashkaro is India’s No 1 cashback and coupon site that offers cashback on every order. In some cases they offer coupons too (Sounds amazing for a shopaholic!). It partners with all major brands that you shop with like Myntra, Jabong, Freecultr, Snapdeal and many more. If you were given Rs 10,000 how would you spend it? How much you save via Cashkaro.com and what will you do with that money saved? Firstly I would feel on cloud nine if I would be given Rs 10,000 for shopping. Since it is a festive season, I would really hope for spending and saving money at the same time. What would be better than shopping via Cashkaro.com? I simply open Cashkaro.com and register myself. As Myntra is my favorite shopping online site, I searched for Myntra and all the offers related to it were displayed in front of me. I chose Myntra Diwali sale offer and simply clicked on the tab ‘Click to activate offer and visit site’. It took me to Myntra’s website. I chose to buy traditional dress for this festive season. 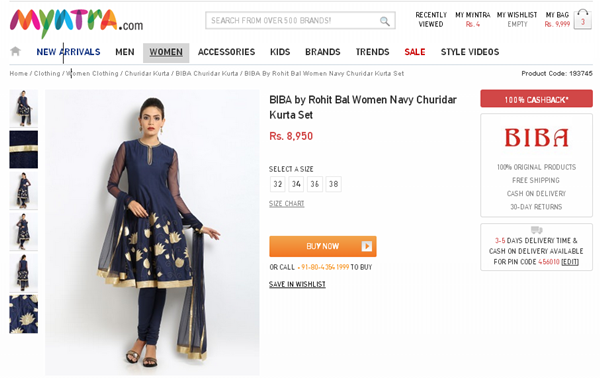 This navy blue churidar kurta set from BIBA caught my eyes due to its unique design. I love the color, anarkali panels and lotus designs over it. It costs Rs 8,950. An ethnic dress will be incomplete without a stiletto. 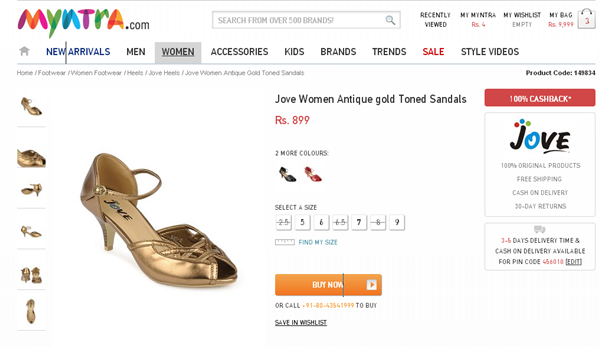 I found this beautiful Antique Gold toned sandal from Jove very elegant and catchy. It costs Rs 899. Now I am left with only Rs 150. 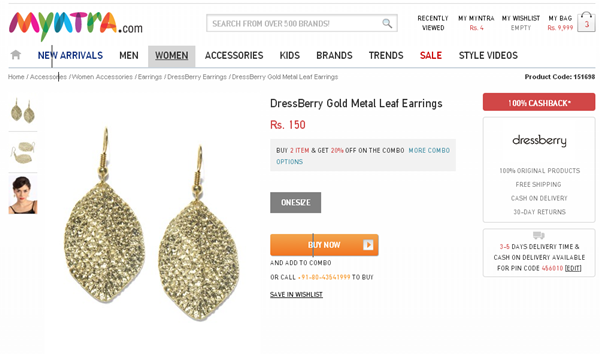 I searched for the jewellery section and chose these gorgeous gold metal leaf earrings from Dressberry. I simply loved its textured detail. All the three items costed me Rs 10,000 and I paid the amount as I would normally do with my debit card. I was given 30% discount on my purchase and I paid only Rs 7,000. Yay I saved Rs 3000. Cashkaro.com will then send you a mail confirming that the cashback has tracked and Rs 180 will be added to your account within 48 hours. With the remaining Rs 3,000, I would spend Rs 1,000 on buying games for my nephew from Firstcry using Cashkaro (Here too I got Rs 150 cashback and Rs 150 off!) and another Rs 2,000 on buying a beautiful clutch for my mom. All in all, I have again Rs 480 in my bank account (*Dance baby dance*). This is how I would shop wisely via Cashkaro. Overall Cashkaro is a super saver for online shopping lovers. It provides great offers with cashbacks and coupons for its users. Not only for shopping, Cashkaro has offers across different categories like food, fashion,travel, baby related, gadgets etc. Before buying online, do visit Cashkaro to earn and avail offers. I would definitely recommend it to everyone! Disclaimer: The entry was being written for the contest running on Cashkaro.com.